Once — not long ago — a small Egyptian police band arrived in Israel. Not many remember this... It wasn't that important. 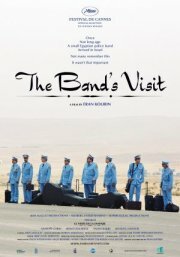 This highly-decorated movie tells the tale of a small Egyptian Police band, who went to play in a village in Israel. They got lost and ended up in the wrong village in the desert. They next bus out will only arrive tomorrow. With no hotel, a local cafe owner arranges for the eight men to shack up with families in the village. Thus do these enemies, the Egyptians and Israelis, get to know more about each other, up close and personal. In English, Hebrew and Egyptian, with subtitles.